I have seen examinations of Link from The Legend of Zelda in regards to the monomyth before. While I think that's interesting, what bothers me is how we examine a fairly blank character while reducing the worth of the titular Princess Zelda to just a damsel in distress. As I see it, although not our focal point in the story, princess Zelda is in fact the true protagonist of several Legend of Zelda games, as their names imply. We merely hook into her story from the perspective of Link. Similar to how Hideo Kojima introduced Raiden in Metal Gear Solid 2 to give us a perspective on Snake without having our own projections as a player cast upon him. The idea of this examination was sparked because of a video by Dangerous Analysis on YouTube, which can be found here in which he discusses a similar idea. One of the biggest mistakes in pop culture labeling Zelda as a "Damsel in Distress" is the characterization of it as her character archetype when in fact it is not. Damsel in Distress is not her role, it is a role she occasionally takes on during her story arch of a particular game. Other roles she takes on include mentor, messenger, and even hero. In Majora's Mask for example, she still bestows Link with a magical gift that helps him on his quest without ever physically appearing and thus never being in danger. Furthermore games like Spirit Tracks blur the lines of "in distress" by having Zelda's body taken while her spirit takes on the role of guide (similar to Navi, Midna and the King of Red Lions) while also being playable through the ability to possess certain types of armor. 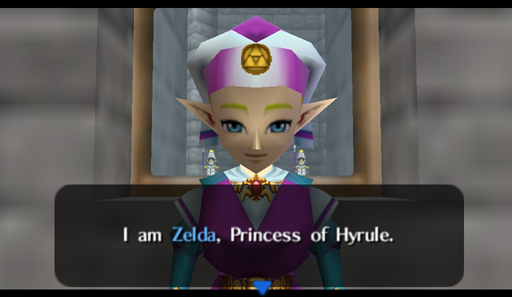 In this particular context, I shall be looking at princess Zelda's role in relation to The Legend of Zelda: Ocarina of Time, although it is my belief that the same principles here apply to Wind Waker and Twilight Princess as well (although in Twilight Princess, Zelda takes a back-seat to Princess Midna). In Legend of Zelda: Ocarina of Time, we catch up with the current incarnation of Link as he has been hidden by his mother and the mystical Great Deku Tree among the Kokiri of Kokiri Forrest to protect him from a war that raged years ago. After he vanquishes the curse cast upon the Great Deku Tree, he sets off to meet the princess of Hyrule, Zelda. He learns of a man from the desert who swears allegiance to the king, but Zelda's prophecy reveals him to be a traitor. Together they formulate a plan to keep the Triforce save from Ganondorf, who plans to use its power to take over Hyrule. The plan fails when they accidentally provide Ganondorf with access to the Sacred Realm where the Triforce is hidden, Link is locked up for 7 years until he is physically mature enough to wield the Master Sword in order to become the Hero of Time, and Zelda goes into hiding while fighting back against Ganondorf under the guise of Sheik. "A usually beautiful young woman is placed in a dire predicament by a villain or a monster and has to be rescued by a hero". By that definition, this certainly happens at one point in Ocarina of Time. Zelda, as the rightful heir to the throne of Hyrule and the keeper of the Triforce of Wisom, is certainly of value as a prisoner to Ganondorf. The problem is that this only happens at the very end of the game*. During the rest of the game Zelda's role could very well be seen as her being the hero of her own story. Of course the frequency with which she is kidnapped in the Zelda series as a whole does become annoying after a while but that still shouldn't mean "Damsel in Distress" is an accurate descriptor of her character. There is also the issue of the final battle. During the first fight between Link and (Gerudo) Ganondorf, Zelda is locked up in a crystal. After the battle Zelda is freed and they escape Ganondorf's crumbling castle together. Ganondorf survived and reemerges to battle Link again in his pig form. Zelda herself is not very helpful during this time but it is important to note that when Ganon is weakened, she is the one to imprison him. This and considering Zelda is an active combatant in Wind Waker and Twilight Princess, one could speculate that her sitting back to watch the battle rather than be a participant has more to do with 1998's limits on technology rather than an attempt to portray her as a weak character. One argument that has been made is that Link, unlike Zelda, has the ability to escape being imprisoned by himself during his visit to Gerudo Fortress. What is left out in that argument is that Link's imprisonment is not necessarily a part of the narrative. The mission in Gerudo Fortress is to infiltrate without being seen to rescue the imprisoned carpenters. Link being imprisoned here is merely a failure on part of the player to do this effectively. In essence the player is transported to the beginning of the board as a sort of soft Game Over. What is in play here are gameplay mechanics, not story elements. * During my latest playthrough I took 30 hours to complete the entire game, which included 100% completion. Out of these 30 hours, Zelda is 'in distress' for 1 hour and 30 minutes at the absolute most. So let's take a look at the various step of the Hero's Journey as proposed by Joseph Campbell and how the several elements can apply to princess Zelda. An often strangely ignored aspect of the Legend of Zelda story structure is the reward for the hero. For Link's quest, Zelda is not the prize to be won (further evidenced in Majora's Mask). Link's reward is the restoration of the status quo. But what is Zelda's reward? We know that there was a king during the time of Ocarina of Time. He wasn't mentioned again after Ganondorf's takeover so we can assume he was murdered. Therefore after the end of Ganondorf's reign of terror, it is Zelda who ascends the throne as queen of Hyrule. This also applies to Wind Waker, in which the King of Red Lions dies with the destruction of Hyrule, and Twilight Princess, in which Hyrule is taken over during Zelda's corronation. The Call to Adventure: Zelda's dream of dark stormy clouds warning her of Ganondorf's treachery. Supernatural Aid: Zelda's prophecy from her dream as well as her gifts by being a princess Zelda. The Crossing of the First Threshold: The escape with Impa from Hyrule Castle. Belly of the Whale: Link is sealed after retrieving the Master Sword, Ganondorf takes over Hyrule Castle. Zelda is forced to flee and unable to return home. Her Sheik persona is born. The Road of Trials: The resistance against Ganondorf during Link's 7 year absence. We see the results in her actions as being victorious in rescuing Princess Ruto and we see her fail against the shadow from the Kakariko well. The Meeting With the Goddess: Just like how Zelda represents Link's 'goddess' in this instance, so does Link's return represent hers. Woman as Temptress: Although not shown or hinted at in the game, in the (non-canonical) manga, Zelda/Sheik hides by becoming a follower of Ganondorf and thus has a taste of the winning side. Atonement with the Father: Zelda receives her part of the Triforce and sets out to face Ganondorf along with Link. Apotheosis: The Sheik persona disappears to make place for Zelda's return. The Ultimate Boon: Sealing Ganondorf into the corrupted Sacred Realm and saving Hyrule. Refusal of the Return: Zelda's hesitance to give up her Sheik persona in fear of Ganondorf finding out about her. The Magical Flight: The escape from Ganondorf's crumbling castle. Rescue from Without: well this is where her status as a Damsel in Distress comes into play. Zelda has to be rescued by Link in order to help defeat Ganondorf. The Crossing of the Return Threshold: Zelda has gained an understanding of her kingdom by traveling it as a Sheikah warrior, and now returns to take dominion over it. Master of Two Worlds: Zelda understands her power and, unlike Ganondorf, how to control it for the good of others. Even other aspects commonly associated with the hero myth such as the miraculous birth can be applied to Zelda through the nature of the trinity that Zelda, Link and Ganon represent as the elements of the Triforce. Surely you can argue over this model, but if so many aspects of Joseph Campbell's monomyth can be applied to the character of Zelda (and not every hero's journey incorporates them all anyway), is it not disingenuous to just label her as a simple "damsel in distress" or a "helpful damsel"? Princess Zelda simply does not qualify as a flat character and that makes reducing her worth to a single sentence meaningless and short-sighted. Princess Zelda is a three-dimensional character with her own emotions, motivations and story who grows throughout the story. What she goes through as a damsel in distress is merely part of her character. It is not her entire definition. While none of these arguments make the need for a game with Zelda as a playable character any less severe (no, the CD-i games aren't proper substitution, make this happen instead), I do think we need to rethink Zelda's position in the games that carry her title as a character worthy of recognition. At the very least there's no need to pretend she is any less than what she is. Patmore Chris, 2005, Character Design. Hilversum. Librero. That clockwork empire thing is interesting, and pretty awesome looking, but still, the "Inspired by Anita Sarkeesian" thing on it rubs me a bit the wrong way. It's like, What? People can't come up with cool stuff like that on their own anymore? Also your post here was really well done- I kind of would like to see a two-sided Zelda game personally... Sort of like the paper Mario games where the princess is shown doing stuff of her own while Mario's running around stomping on goombas. They could also just make Link's gender optional at the start. He already looks pretty androgynous in a couple games and his gender isn't that important anyway. I always thought that was the POINT of Link's androgynousness, if you will. XD I mean, all you REALLY need to do is remove all pronouns and gender related words for him, and bingo- gender neutral Link. BTW, shared this blog with my girlfriend- a fellow long-time Zelda fan. She liked it. You missed an opportunity here. At the end of the game, after defeating Ganondorf in his human form, Link is in serious trouble. The castle is falling down and all of the passageways have been sealed by great metal bars. His choices, if alone, would have been to go down with the castle, or to take his life into his own hands and jump off. So! Link finds himself a man in distress who can only follow behind Princess Zelda while she leads the escape. I will agree that Zelda is not [i]always[/i] a DiD, but as you mention that [i]is[/i] a role that she is cast as numerous times. In my mind Zelda doesn’t have to be helpless to be a Damsel, she just has to be rendered helpless while ‘Damseling’ and while yes that may be because if Zelda rescued herself there would be nothing for Link to do and the game would be boring, but I think the core problem, the real one, is that despite Zelda’s many accomplishments, despite all her professed abilities and powers; up to and including capturing a weakened Gannon in much the same way he captured her, when it comes down to it, when it [i]really[/i] comes down to it, what is the lesson Zelda’s story, Zelda’s [i]entire[/i] story teaches? We don’t get to see Zelda fighting off Gannon for seven years while Link is in training. We don’t get to see how she handles that threat to her empire and people, that’s not part of the story. What is part of the story is how Zelda is captured by Gannon, how she is helpless to free herself, and how she is required, (maybe ‘forced’) to rely on Link to defeat Gannon, and is only allowed to lock him up after he’s been defeated. What does her story teach? She may have been the noble princess laboring to defend her people night and day; but she was wasn’t fighting to [i]win[/i] she was just in a holding pattern until Link came back; and despite being show to be fully capable of capturing Gannon after he’s weakened, (and for my money shown to be a good deal smarter than Gannon just in general) in seven years of fighting him, she makes no noticeable progress against him. Link doesn’t pop out ready to fight only to see that Zelda has cleverly tricked Gannon into getting captured, he pops out to Zelda flying a holding pattern waiting for him to save the day. And while she is captured, despite being one of the most powerful people in the world, she doesn’t escape on her own; which she arguably should have been able to with Gannon’s attention on stopping Link’s advance and her own magical ability theoretically matching Gannon’s, she’s at least strong enough to trap him when he’s weak I see no reason why she wouldn’t be strong enough to escape his hold while he’s distracted. For all her accomplishments and powers, Zelda relies on Link to save the day [u]every time[/u], and yes that may be because that’s just the narrative, but [b]that’s the problem[/b] narratives like Zelda’s regulate characters like Zelda to Damsels, with no regard for their abilities or the effect making them damsels has. You know what someone who grew up with the goal of emulating Zelda would be like? Smart, Bold, Determined, Noble, maybe a little bit cheeky, and totally convinced that if they ever encountered a [i]really[/i] bad problem; someone else would come in and save them from it. They would be waiting for their hero, instead of going out and [b]being[/b] the hero. It would be nice to take charge of playing the princess at least once in her own game. And she would be an amazing mage fighter, I can imagine. So yes, I would like to see a game where she's the protagonist. Just once so everyone (including me as a child) would think Link was Zelda.